A symposium on "3D Digital Archaeology: Reconstruction, analysis and conservation of cultural heritage," will bring top international researchers from engineering and the humanities to the UR from noon to 6:30 p.m. Dec. 4 in Eisenberg Rotunda of Schlegel Hall. They will discuss state-of-the-art multidisciplinary issues bridging the humanities and the applied sciences related to 3D modeling, visualization, and analysis—including engineering evaluations—of complex archaeological structures and data. Leading researchers will outline current work and cutting-edge applications in virtual archaeology and digital humanities as well as in image processing, dynamic monitoring and structural analysis of monuments. Presentations will be followed by a roundtable in which invited participants will discuss how they use or envision use of 3D digital modeling in their present or future research or in the field of material cultural heritage broadly conceived. The symposium is free and open to the public. Lunch is included. Bernard Frischer, School of Informatics, Indiana University, and Director of the Virtual World Heritage Laboratory. "3D Digital Archaeology in the Virtual World Heritage Library." Luis Jaime Castillo, Archaeology, Pontificia Universidad Catolica del Peru, Lima, and Director of the San Jose de Moro Archaeological Project. "Drones in the Archaeologist's Toolkit: 3D Reconstruction of the Moche Site at Cerro Chepen." Renato Perucchio, Mechanical Engineering, University of Rochester, and Director of Archaeology, Technology and Historical Structures Program. "The Engineering Design of Concrete Roman Vaults: 3D Computational Models for Structural Analysis." Graeme Earl, Archaeology, University of Southampton, UK, Director of Digital Humanities. "Contemporary Themes in 3D Archaeological Computing." Gabriele Guidi, School of Design, Politecnico di Milano, Italy, and Program Chair, Digital Heritage International Congress 2013. "From the Physical Object to its Digital Representation: Reverse Engineering Gismondi's Model of Imperial Rome." Rafael Aguilar, Civil Engineering, Pontificia Universidad Catolica del Peru, Lima, and Director of Structural Health Monitoring of Architectural and Archaeological Heritage. "Dynamic Monitoring and 3D Reconstruction: the Moche Huaca de la Luna Multidisciplinary Project" (with Castaneda). Benjamin Castaneda, Electric and Electronic Engineering, Pontificia Universidad Catolica del Peru, Lima, and Director of the Image Processing Laboratory. "Dynamic Monitoring and 3D Reconstruction: the Moche Huaca de la Luna Multidisciplinary Project" (with Aguilar). Roundtable participants will include Annetta Alexandridis, History of Art, Cornell University; Robert Beutner, Digital Humanities Center, Rush-Rhees Library, University of Rochester; Luis Castaneda, Art and Art History, Syracuse University; Elizabeth Colantoni, Religion and Classics, University of Rochester; Nora Dimmock, Digital Humanities Center, Rush-Rhees Library, University of Rochester; Michael Jarvis, History, University of Rochester; Brian Lonsway, Architecture, Syracuse University; and Joan Saab, Art and Art History, University of Rochester. The symposium is organized by Renato Perucchio, Professor of Mechanical Engineering, and Director of the Program in Archaeology, Technology, and Historical Structures, and Elizabeth Colantoni, Assistant Professor of Classics in the Department of Religion and Classics. To register, contact Perucchio at rlp@me.rochester.edu. The symposium is co-sponsored by the Humanities Project, University of Rochester School of Arts and Sciences; the Central New York Humanities Corridor, from an award by the Andrew W. Mellon Foundation; and by the Program in Archaeology, Technology, and Historical Structures through the Selwyn Endowment Fund. This image illustrates how computational advances have provided new tools for engineers and researchers to simulate how various structural designs react to stress. 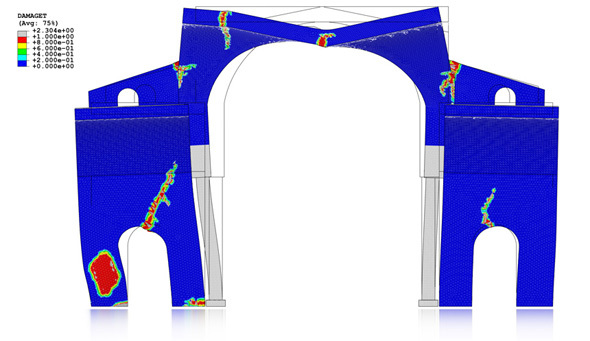 Renato Perucchio, Professor of Mechanical Engineering, and one of his graduate students, Sarilyn Swangyim, used nonlinear finite element modeling to simulate damage to an unreinforced concrete vaulted structure, caused by lateral acceleration that might occur during an earthquake. Nonlinear finite element analysis takes into account the changing "stiffness" of a structure over time, but engineers were traditionally hesitant to use it because of its complexity. Now, nonlinear FEA software can interface with computer assisted design, making it easier to use. Improved algorithms and increased computational power result in shorter solution time, even with a desktop. Engineers use nonlinear FEA modeling as a tool in design of new structures; Perucchio and his students employ it to analyze ancient structures, thereby advancing our knowledge in archaeology, the history of technology, and the conservation of monumental structures. Click here to read more. The illustrated 3D finite element model shown here, for example, represents the Frigidarium of the Baths of Diocletian, a gigantic vaulted structure built in Rome with unreinforced pozzolanic concrete (AD 298-305), still intact and in excellent structural condition, and being used as one of the most important churches of Rome.